High-rise rental apartments being built on a former parking lot in the heart of downtown Los Angeles. 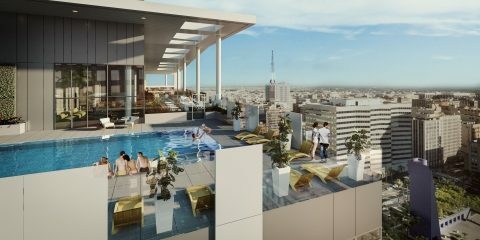 A 24-story residential high-rise with street-level retail space being developed on a surface parking lot in downtown Los Angeles, which has emerged as a popular residential neighborhood and entertainment hot spot over the past 15 years, its population having grown by more than 30% since 2000. Adjacent to Trademark, a seven-story apartment building with ground-floor retail space that is also being developed by MacFarlane Partners. Located at West 5th Street and South Olive Street, directly across from Pershing Square (the largest open space in downtown L.A.), diagonal to the historic Millennium Biltmore Hotel and one block south of Grand Central Market. Just east of two iconic office towers: U.S. Bank Tower, the tallest building west of the Mississippi River; and the Gas Company Tower. Within five blocks of the site are more than 25 million square feet of office space and 50 restaurants. Across West 5th Street from the Pershing Square Metro Station, which provides commuters with underground-rail access to points throughout L.A. The building also will be located along the planned route of downtown’s restored historic streetcar line. Planned amenities include a 360-degree-view rooftop deck featuring a club room, a fitness center, a clubhouse with a bar/kitchen, TVs, ample seating and a business center, and an infinity-edge pool with cabanas; on-site resident concierge services; a controlled-access bike storage and repair area; and a dog walk and washing station. 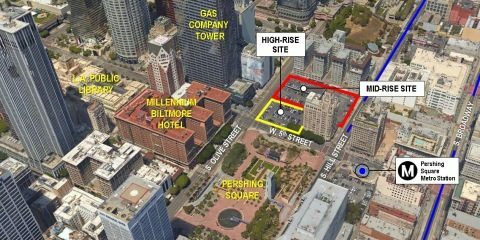 MacFarlane Partners has helped establish and fund a non-profit organization, Pershing Square Renew, which is redeveloping neighboring Pershing Square as a world-class public space. 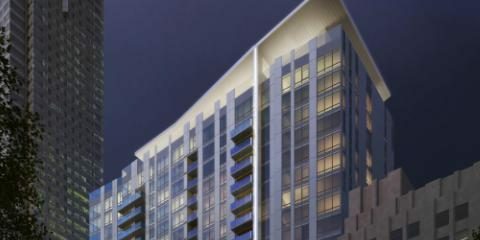 Targeting LEED-Silver certification, under the U.S. Green Building Council’s green-building rating system, upon the completion of construction.